How to fill Online Application form for TS B.Sc(Forestry) 4 year course admissions: TSFCRI, Telangana State Forest Academy is inviting the the online application forms from the eligible and interested candidates for admission into the B.Sc. 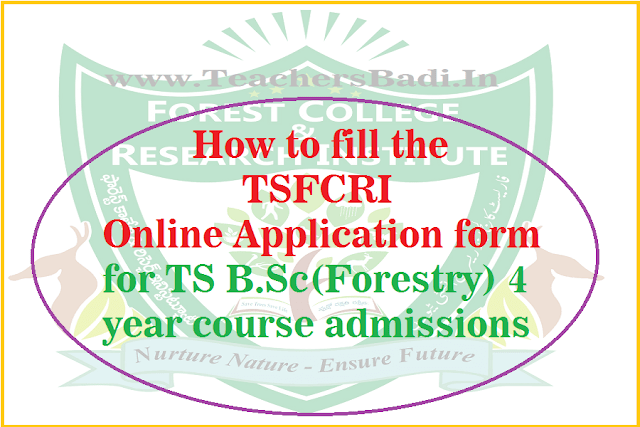 (Forestry) 4 year degree programme at Forest College & Research Institute (FCRI), for the academic year 2018-2019. Application form duly filled in should reach The Officer Incharge Admissions - 2018, Forest College &amp; Research Institute(Affiliated to Osmania University) Telangana State Forest Academy, Dulapally Village,Hyderabad – 500 014. On or before: 22-06-2018. Postal delays will not be entertained. Edit Registration Form: Online application form submission process to be completed in June 2018 and Edit Option to be available for editing in application form. So, Candidates may edit the Registration form If you have made any mistakes on it(online application form). Step 3: fill the required fields in application form care fully. Step 4: After submitting an application the report of the page will be appeared. / PH candidates towards application fee online on or before 30-06-2018 by 05:00 PM. Candidates can apply up to 30.06.2018 without late fee . Model Online Application Form for admission into B.Sc. (Forestry) 4 year course. Telangana State Forest Academy,Dulapally Village,Hyderabad – 500 014. 7. Are you a candidate seeking admission under any of the following categories? (Mark Yes / No). If so, enclose the relevant certificate(s). 16. Mobile No. Enter Mobile No. Note: The candidates shall note that the admissions will be made as per the relevant government orders applicable at the time of admission. How to edit my forestry degree application . please help me.i paid my fee.i did two mistakes. 1.birth place yadadri i filled adilabad.